Where does Winnie the Pooh live? Winnie the Pooh lives by himself in a tree in Hundred Acre Wood under the name of Sanders. "It means he had the name over the door in gold letters, and lived under it. "- the book said. This is the Pooh from the book. 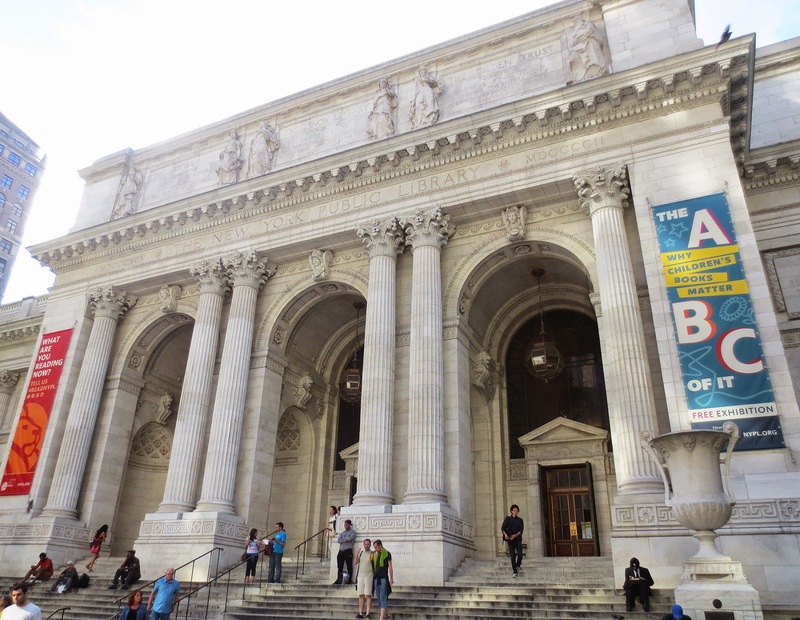 The real Winnie the Pooh and his five friends live now in the New York Public Library, located near Bryant Park in midtown New York. 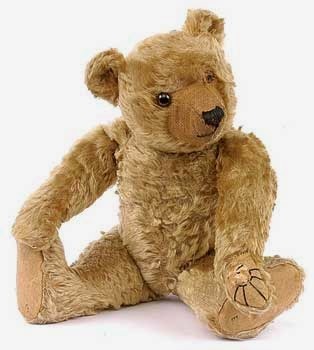 The stuffed bear was made at the J.K. Farnell factory, which made bears exclusively for Harrod's department store in London in the 1920's. 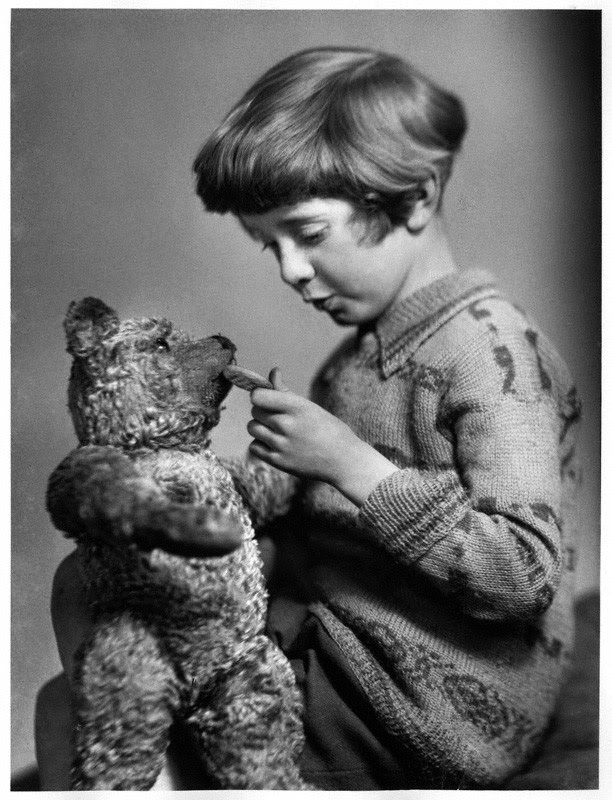 English writer Alan Alexander Milne the author of the book) bought the bear, originally known as Edward Bear, in 1921 when his son Christopher Robin was one year old. Christopher had named his toy after Winnipeg, a bear which he and his father often saw at London Zoo. During the first World War, troops from Winnipeg (Manitoba, Canada) were being transported to eastern Canada. When the train stopped at White River, Ontario, a lieutenant Harry Colebourn bought a small female black bear cub for $20 from a hunter who had killed its mother. He named her 'Winnipeg', after his hometown of Winnipeg, or 'Winnie' for short. Winnie went to Britain with the unit. Colebourn, now a Captain, took Winnie to the London Zoo for a long loan. He formally presented the London Zoo with Winnie in December 1919 where he became a popular attraction and lived until 1934. Eeyore was brought for Christopher as a Christmas gift in 1921, Piglet was a gift from a neighbor of the Milne family in Chelsea. Kanga and Roo appeared in the nursery in 1925, while Tigger didn't show up in the nursery until 1927. Owl and Rabbit have never been never real toys. 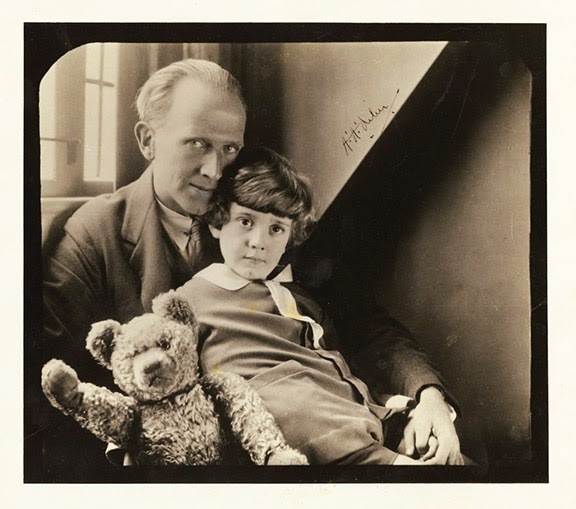 Elliott Macrae, the American publisher of the Pooh series, visited A.A. Milne at his house in Sussex in 1947 , and sees the original toy animals in the corner of the living room. Mr. Milne gave Mr. Macrae the toys as a gift, and with Mr. Milne's permission, he took the toys on a promotional tour of the United States. Milne provided a 'birth certificate' to travel with the toys. Dutton Publishing, American publisher, insured the toys for $50,000, a vast amount of money in those days. The real Pooh and friends were on a tour for ten years and in 1956 were put on display at E.P. Dutton & Co. Publishers in New York City. 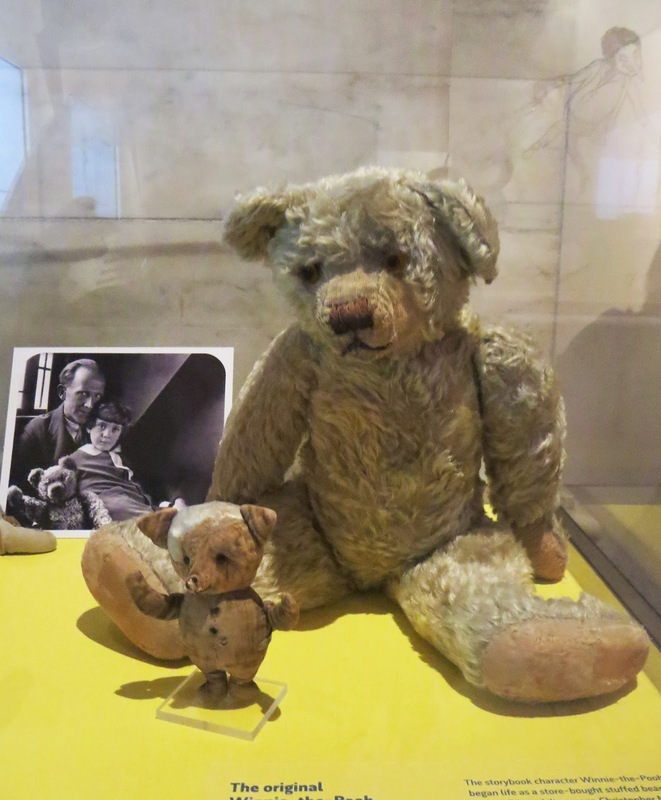 The stuffed animals made their last trip to England in 1976 to participate in the 50th birthday of Winnie-the-Pooh. 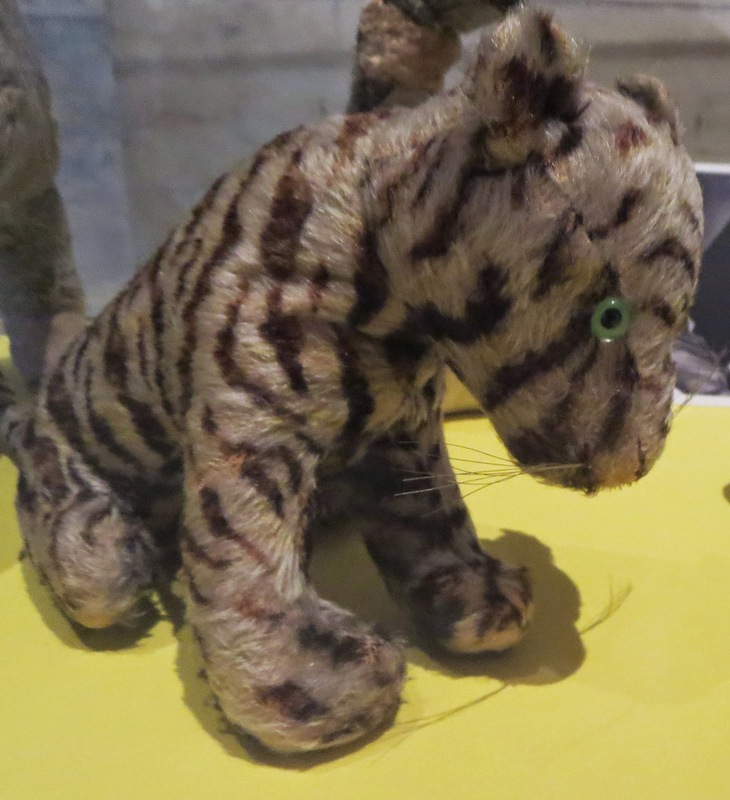 In 1987, the owner of the five toys gave them to the New York Public Library, with the blessing of Christopher Milne, on the sole condition that they be publicly displayed. 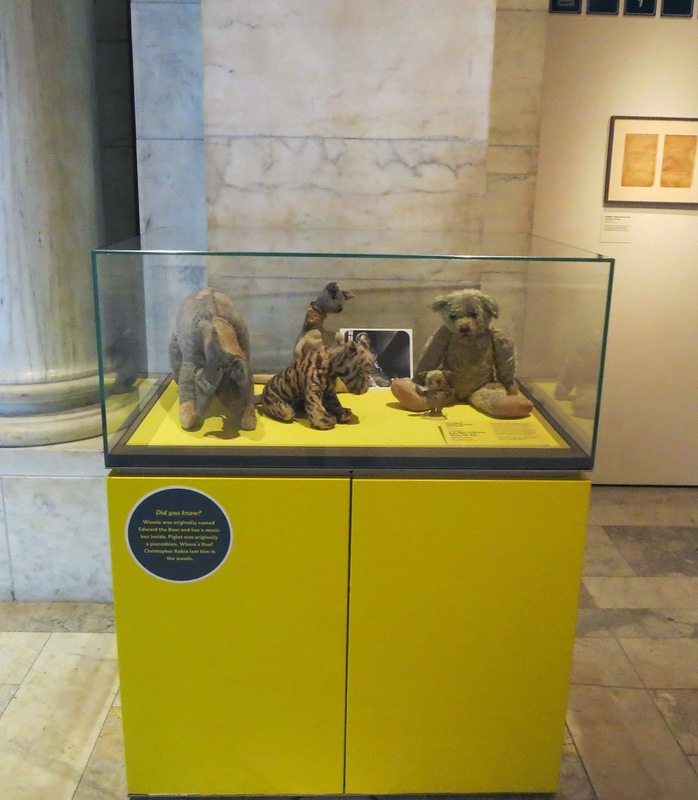 For the next decade, the original Winnie-the-Pooh and his four friends associates, Tigger, Eeyore, Kanga and Piglet, have resided in a climate-controlled display case in the children's room of the New York Public Library's Donnell Library Center on West 53d Street. In the beginning of the 1998 Ms. Dunwoody, a member of the British Parliament, decided that the toys were being held against their will. ''I saw them recently and they look very unhappy indeed,'' Ms. Dunwoody said , ''I am not surprised, considering they have been incarcerated in a glass case in a foreign country for all these years. ...Just like the Greeks want their Elgin Marbles back -- so we want our Winnie the Pooh back, along with all his splendid friends,'' she said and asked the British Government to secure the release of the bear and his friends and to return them to England. Today you can see the beloved toys in a bulletproof climate and light controlled glass cube with its own alarm system at the NYPL Children's Center, room 84. For centuries, artists have understood the benefits of painting with north light which has helped produce some of the greatest paintings in history. In the northern hemisphere the sun moves across the southern sky. As the sun moved, the light would be constantly changing, in both direction and intensity if the artist studio has a south exposure. The window on the north side of the studio would not be subjected to the direct light of the sun but would, rather, receive only a soft diffused light reflected off the northern sky. Studious with the large windows to the north were always in great demand in New York. I already wrote about Rodin Studios (200 West 57th) in one ofmy posts. Several minutes by foot from Rodin studious there is another example of the artists coop built at the beginning of the 20th century- Gainsborough studious on Central Park South. Central Park South was a perfect location for the intended studio. 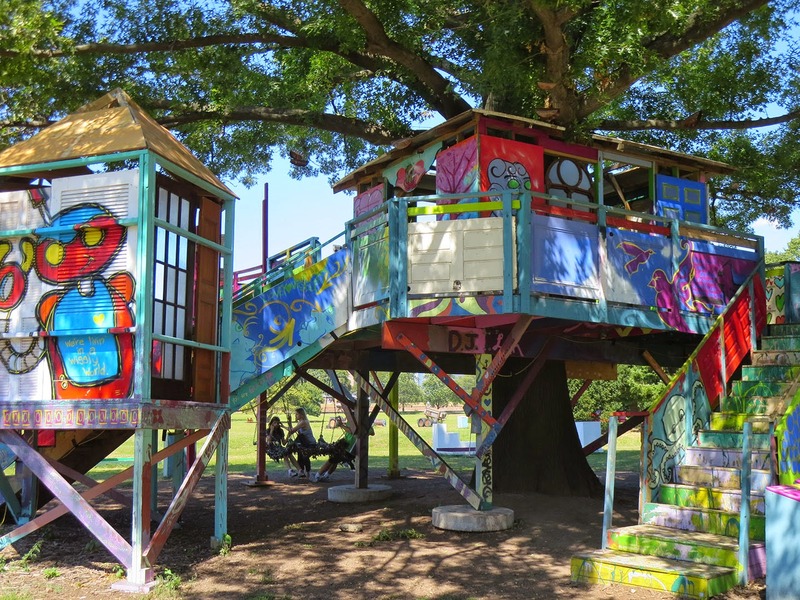 Facing the park, the artists were guaranteed that their northerly light would never be blocked by construction. The posh Plaza Hotel was completed in 1907, giving the neighborhood added prestige; and the American Fine Arts Society Building was a mere two blocks to the south. West 59th Street did not become Central Park South until 1896, by action of the city council. 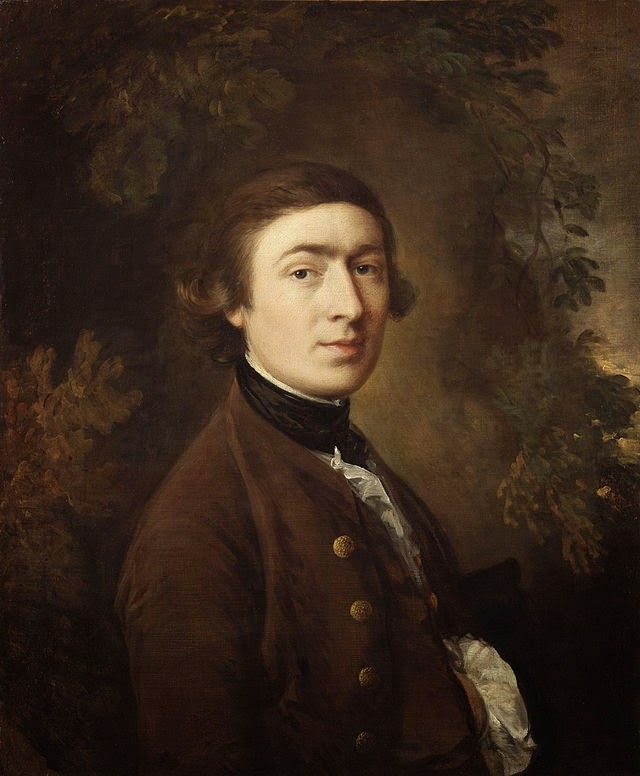 The name came from August Franzen, portrait painter and the president of the Gainsborough Corporation, who admitted that Thomas Gainsborough’s work was a model for his own. The cooperative purchased and demolished the home of millionaire Walter E Delabarre at 222 Central Park South in 1907. To design this special type of Architecture the members of the corporation hired architect Charles Buckman, who was very interested in the design of duplex apartments. Because the northern light was available only on one side of the building there were smaller apartments located to the rear of the house. According to the tenement house law of this tome apartment building could not be more than one and half times as high as the width of the street In order to avoid the legal problems, Gainsborough studios were classified as a hotel with communal kitchen and dining room on the first floor an minimalist kitchenettes in the apartments. There were 18-foot ceilings, mahogany and oak woodwork, built-in cabinets with leaded glass doors and art tiled fireplaces. The building had package and telephone room , a central vacuum cleaner system, laundry room and storage room . Perhaps the most striking future the building is the frieze that separates the first floor from the others. Konti's "festival Procession" terra-cotta frieze show people of all ages carrying gifts to the altar of arts. There is a bust of Thomas Gainsborough in the niche that rises to the third story level. This is one of those places in the city where you realize how amazing NYC really is. 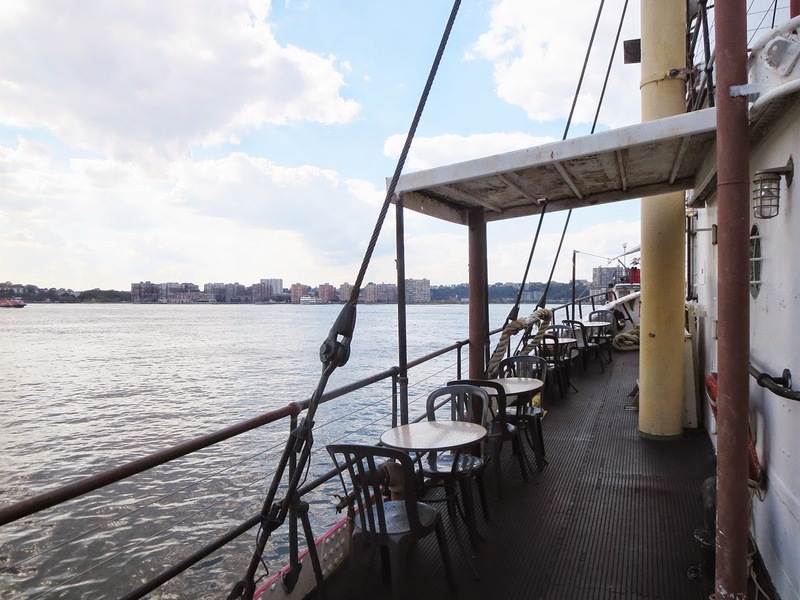 The floating restaurant on the Hudson with amazing views from all angles of wherever you sit is locates at the very end of West 26 street in Chelsea. My friend and I came here for a short break on a sunny Thursday afternoon a week ago after walking the High Line(elevated freight rail line transformed into a public park on Manhattan's West Side). I fall in love with this place, and we ended up hanging here for almost three hours . I felt like I was on vacation - the wind, the faint scent of salt in the air... The view was incredible! And the history behind this place is really interesting. In 1929 the lightship name just " Lightship No. 115 " was built in Charleston, South Carolina for Cape Fear, North Carolina. Since the late 1800s lightships had been used to guide other ships around harbor entrances and dangerous shallow sandbars. 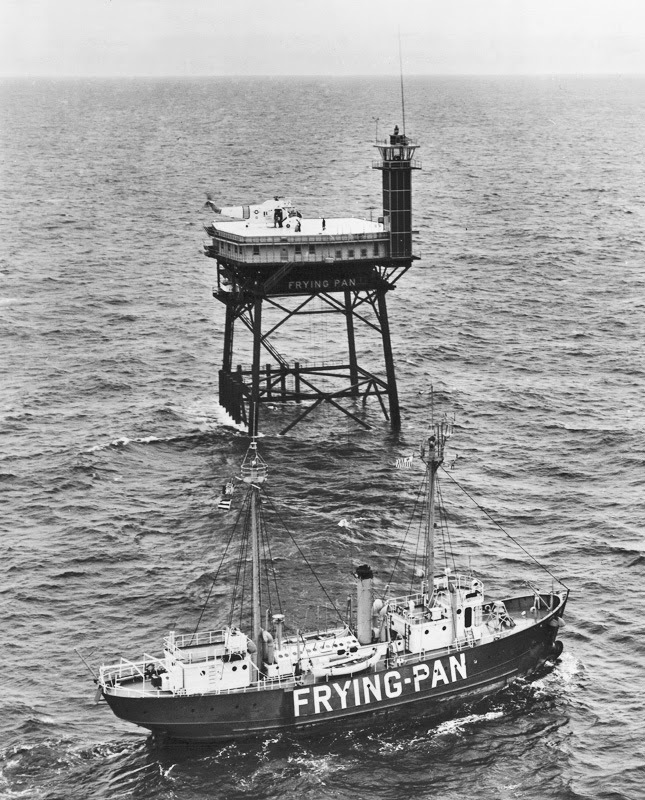 The Frying Pan ship was moved to an old oyster cannery on the Wicomico River in the Chesapeake Bay where she spent next ten years. She sank due to a broken pipe and was underwater for three years before being raised by salvers. John Krevey, an electrical contractor and businessman from New York City bought the ship for $8,000. Krevey installed a truck diesel engine and started and started a coastal sea voyage to the Hudson River in 1983. 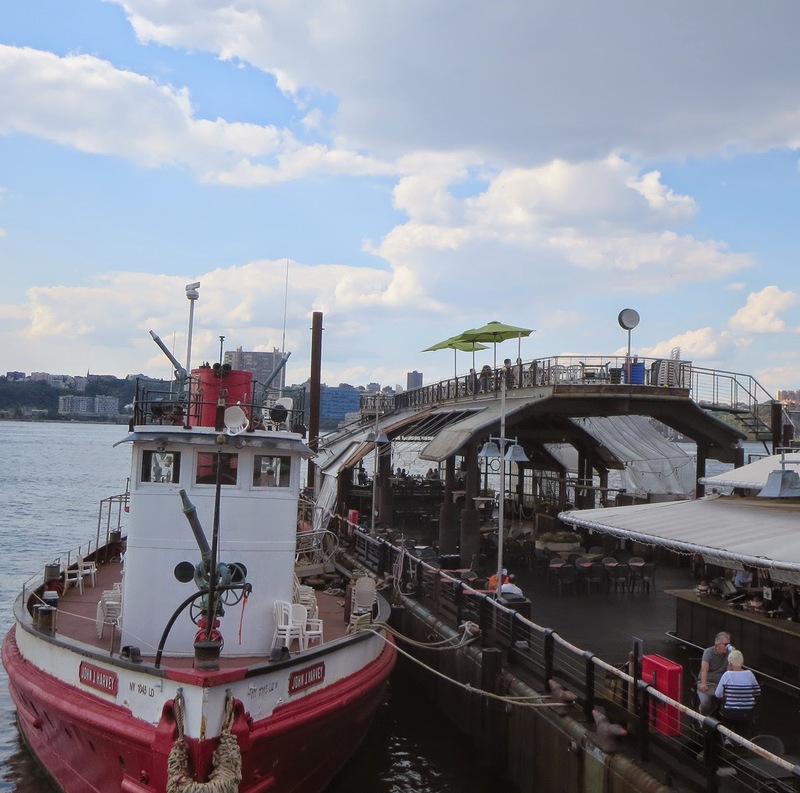 By 1991, he had it docked temporarily at Pier 59 on the Hudson River at 18th Street. 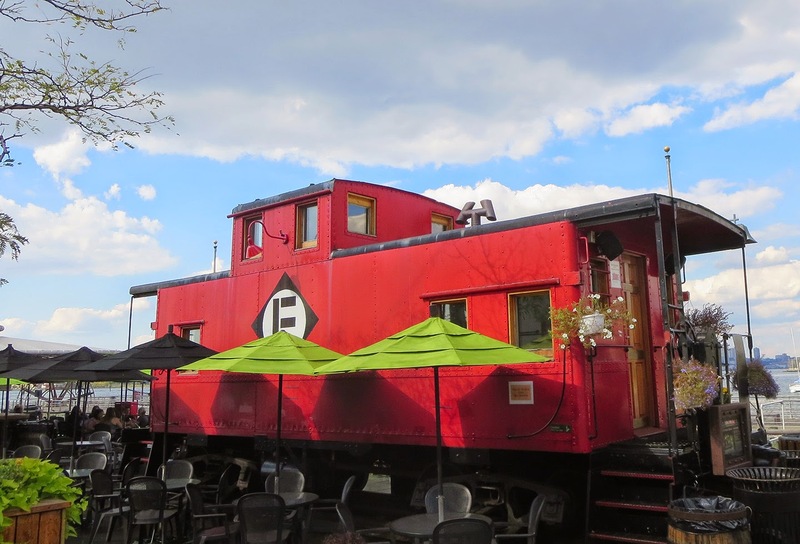 Until the early 1970s, railroad cars used to float into Manhattan by barge, then link up with railroad tracks at the waterfront, and finally to warehouses located nearby. 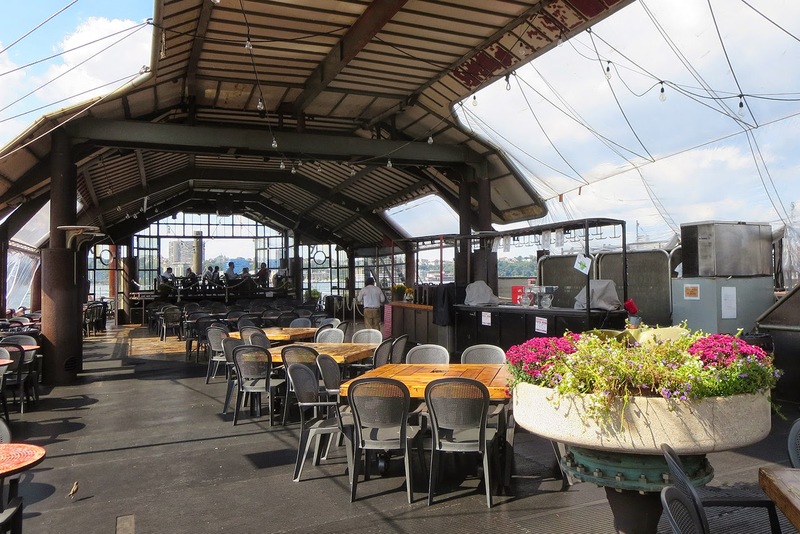 In 1996, Krevey acquired an old railroad barge that formerly carried railroad boxcars across the Hudson River, and tied it up on the north end of Pier 63, at W. 23rd St. In 2000, Krevey and friends bought the John J. Harvey, a decommissioned fireboat. Built in 1931, MV John J. Harvey, is among the most powerful fireboats ever in service. Her pumps are powerful -- enough so that when she and the George Washington Bridge were both brand new, she shot water over the bridge's roadway. On Sept. 11, 2001, the ship helped evacuate Battery Park City residents and after that under radio direction from the Fire Department, trained its powerful water pumps on the blazing towers. 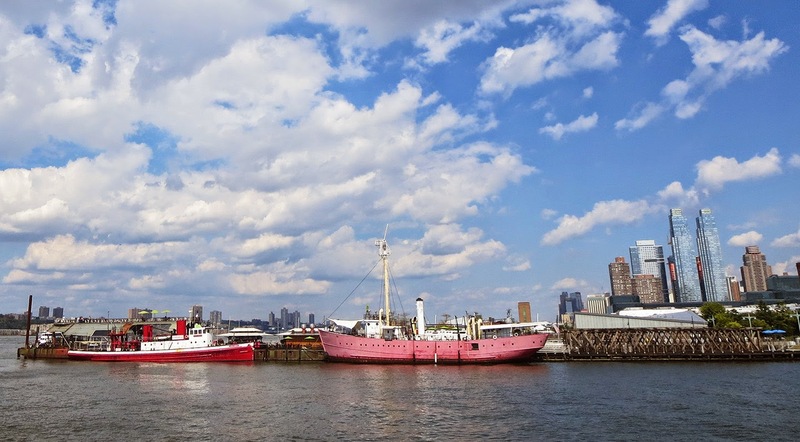 In 2008 Krevey rented a tugboat and moved the Frying Pan, the barge and John J. Harvey to Pier 66 (3 city blocks north). Three years later in 2011 John Krevey died at age 62 while on a vacation with his son in Santo Domingo. The cause appeared to be a heart attack. 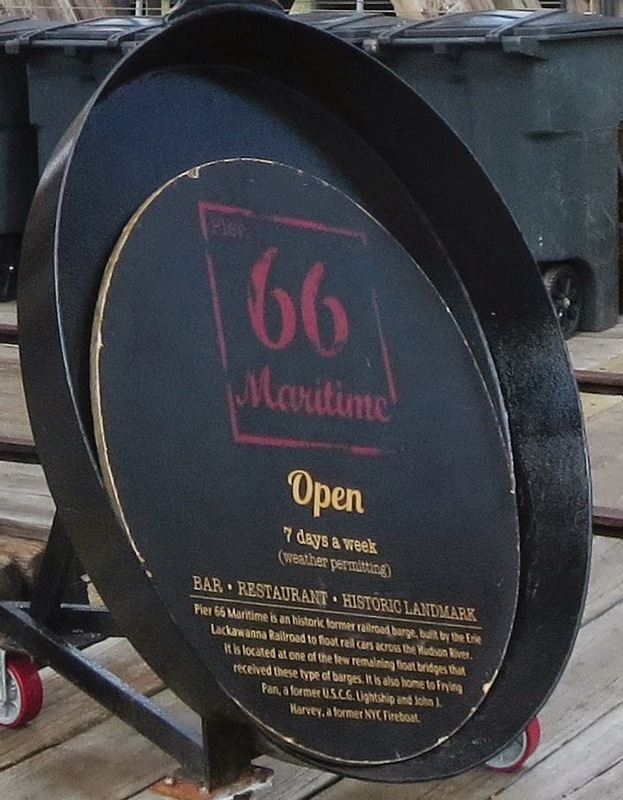 Today Pier 66 is a part of Hudson River Park and includes a former Lackawanna railroad barge, the Pier 66 Maritime Bar & Grill, the Lightship Frying Pan, a historic rail float bridge, and an authentic 1900′s caboose. 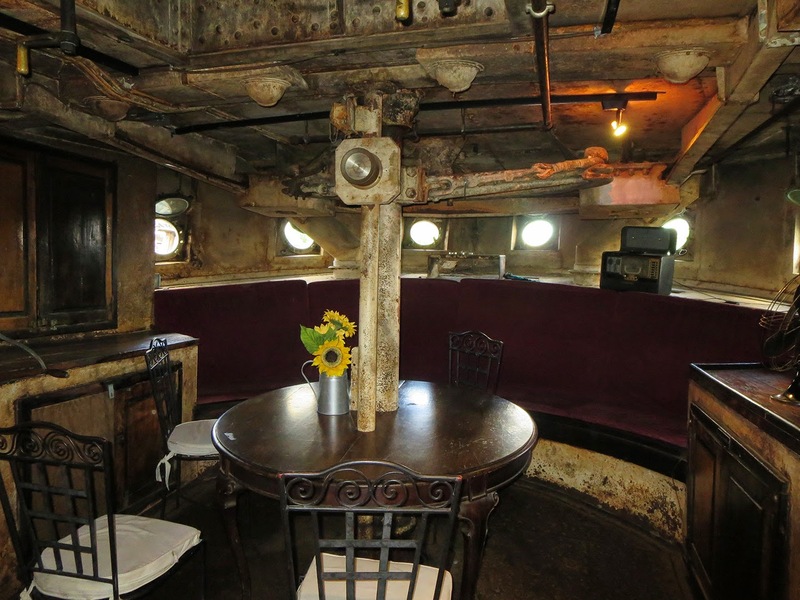 While the outside of the Lightship Frying Pan has been restored to her original appearance, the inside retains the barnacle-encrusted, sunken-ship motif that acknowledges her storied past. 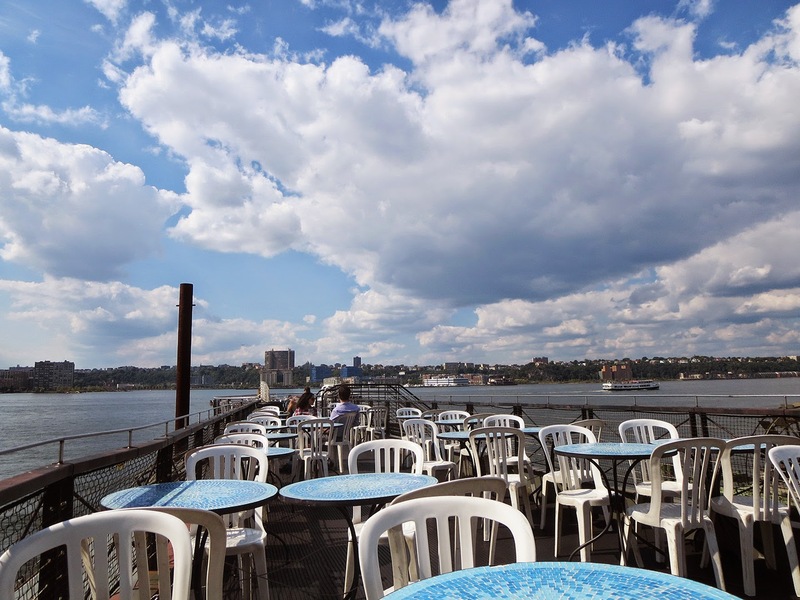 Pier 66 is open 7 days a week from May 1 to October 1, and in October only when weather is 65 F (18 C) degrees or over. 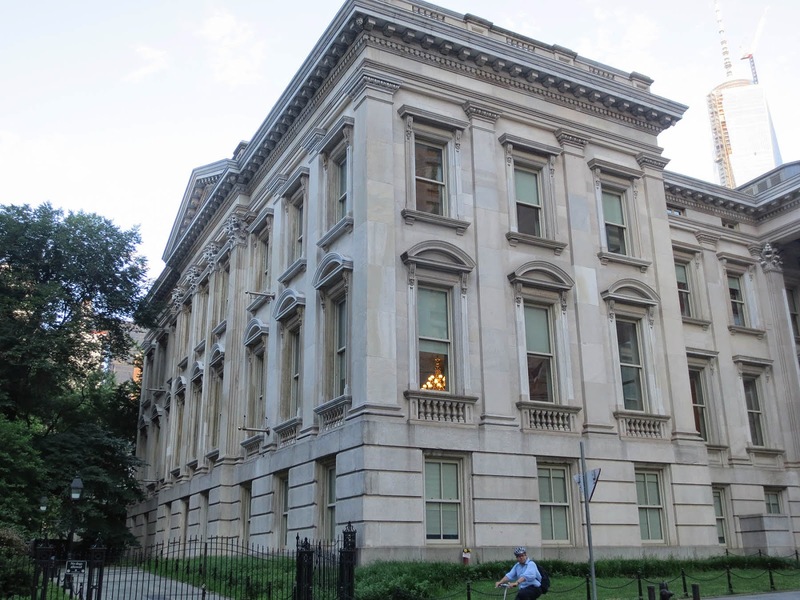 The house that Tweed built: A symbol of municipal corruption. 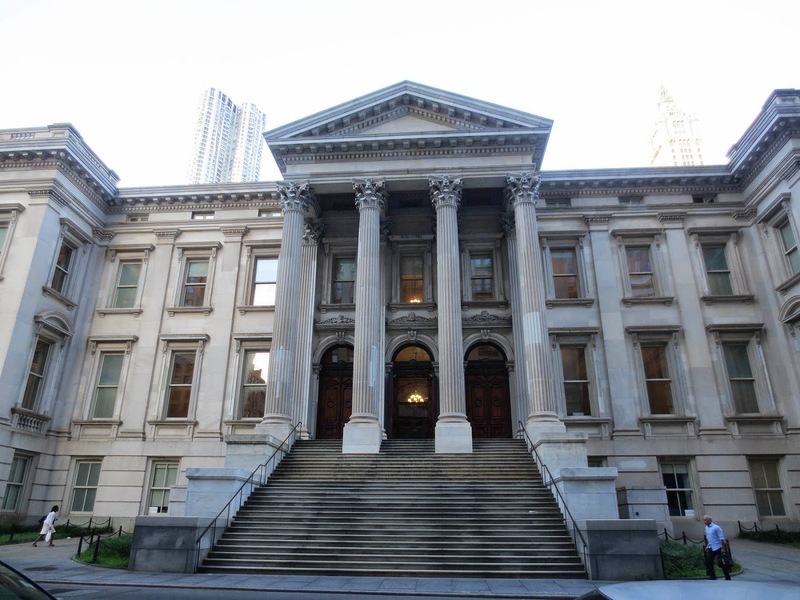 The Old New York County Courthouse-"Tweed Courthouse" , located on the north side of City Hall Park, behind City Hall, on Chambers Street, is one of New York’s greatest civic monuments. The Courthouse was built between 1861 and 1881 and is the costliest public building that had yet been built in the United States. Its construction cost nearly twice as much as the purchase of Alaska in 1867. Tweed Courthouse is known as the greatest single thievery project of 'Boss Twed'. You cannot understand New York without understanding its most corrupt politician -- William 'Boss' Tweed (1823-1878), who led a group of corrupt politicians who gained power in the Democratic party in 1863. Tweed started working at a brush factory, and moved into management after marrying the owner's daughter. By the late 1850s Tweed and his associates controlled the group, and in 1863 he was elected Chair of Tammany Hall, the behind-the-scenes group that had make-or-break power over local Democratic Party nominations. "Boss Tweed" was himself appointed a Deputy Street Commissioner, and began putting cronies on the city payroll for doing no work. Tweed bought several companies which were promptly awarded city contracts. He was elected to the State Senate in 1867, and within months had charmed and cajoled his way to similar near-absolute control over the state's capitol. It has been estimated that during his reign of corruption, William Magear Tweed, the “Tiger of Tammany,” and his political cronies stole $200 million (the equivalent of about $3.5 billion in today’s money) from the citizens of New York. In an era in which all of the land for Central Park cost New York City $5 million, and the elaborate St. Patrick’s Cathedral cost $2 million to build, the Tweed Courthouse wound up costing New York’s taxpayers $12 million (equivalent to about $200 million today). The Tweed courthouse was not completed until 1880, two decades after ground was broken. By then, the courthouse had become a symbol of public corruption. "The whole atmosphere is corrupt," said a reformer from the time. "You look up at its ceilings and find gaudy decorations; you wonder which is the greatest, the vulgarity or the corruptness of the place." Building bills were wildly inflated in order to provide generous sums for kickbacks. Enough carpet was ordered to cover all of City Hall Park three times, and many of the companies billing for carpeting did not even exist. The final costs for brooms for the courthouse, $250,000, matched the total originally budgeted for the entire building! 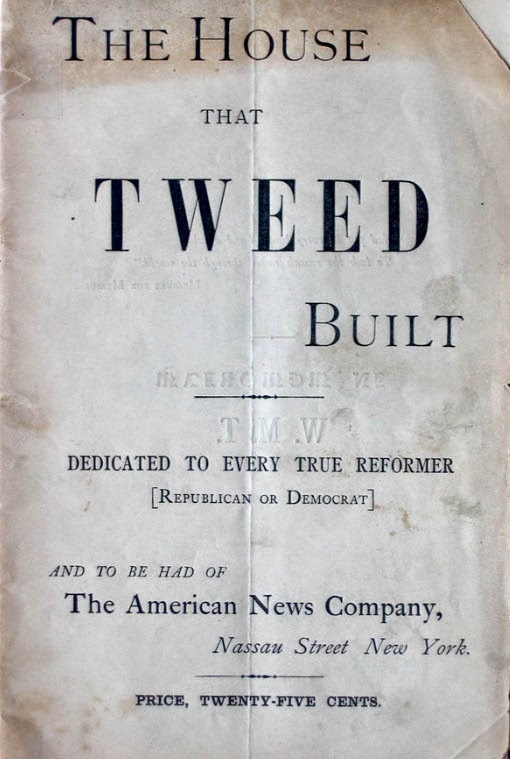 The immediate cause of Tweed's downfall was the publication in the New York Times of evidence of wholesale graft revealed by M. J. O'Rourke, a new county bookkeeper. 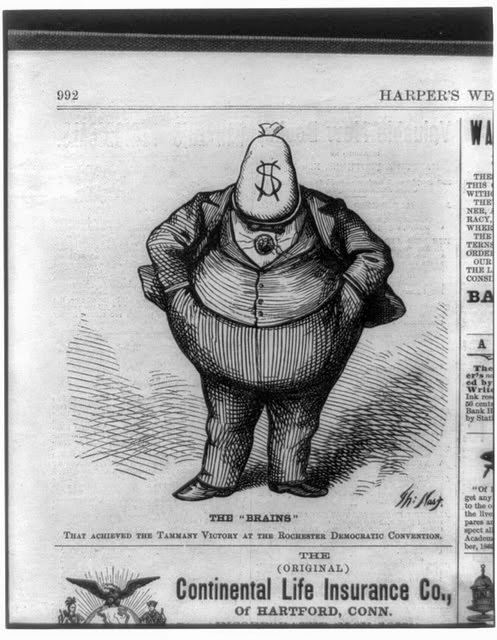 In famously barbed caricatures, Thomas Nast, cartoonist for Harper's Weekly, was one of the few prominent voices to speak against Tweed. Tweed was tried for felony, but the jury could not reach a verdict. In a second trial he was convicted and given a 12-year prison sentence; this, however, was reduced by a higher court, and he served one year.He was arrested once more on other charges, but escaped from the prison and fled to Cuba, then Spain. In Spain he was recognized from Nast's political cartoons and was turned over to an American warship which delivered him to the authorities. 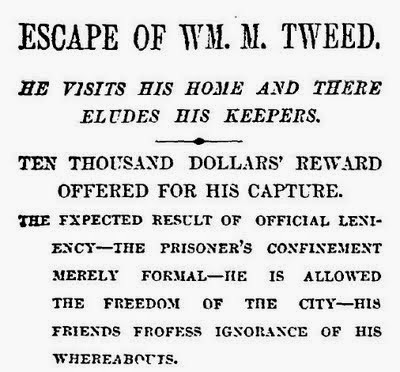 Tweed died in prison two years later. "William Tweed had left enormous footprints on his city; he had built as grandly as he’d stolen. His monuments dotted every corner of Manhattan – the new Brooklyn Bridge rising across the East River, the opulent new County Courthouse by City Hall, the widened, paved streets up Broadway and around Central Park. Just as striking were shadows of his huge crimes- the huge debt and ruined credit that would haunt city finances for a generation, the broken lives and shattered trust of former friends. 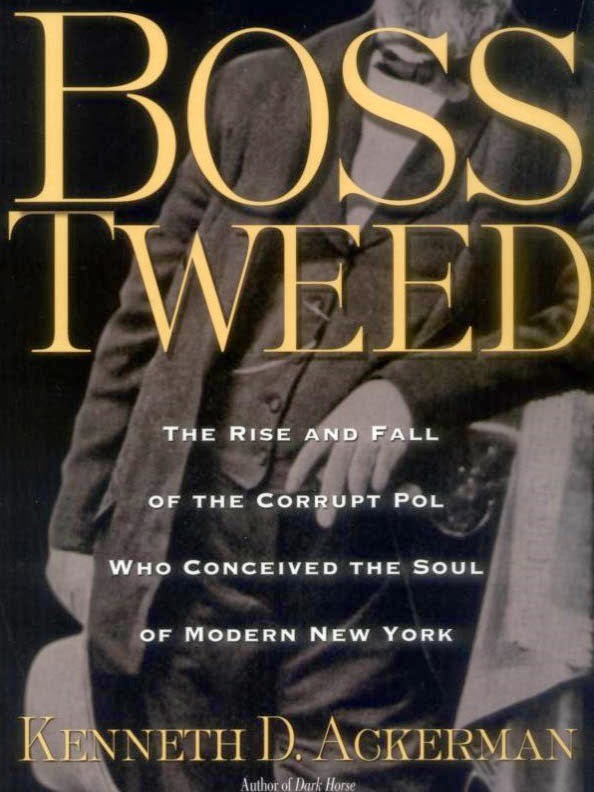 Tweed had defined a grimy reality of American politics, perfecting forms of graft and voting-box abuse mimicked by political bosses for the next century, but never on so grand a scale. His fall had created a new role for a free, skeptical press in the public arena, and his legal persecution had set a tone for political scandals lasting generations." In the spring of 1999 Tweed house was restored. Archaeologists from Hartgen Archeological Associates, Inc., hired to test for archaeological resources during the restoration, found 23 intact skeletons, mostly in front of the building and just inches below the sidewalk. The restoration firm carefully removed as much as 18 layers of paint to reveal the original brick walls and cast iron in order to recreate the original paint colors. The Guide to New York City Landmarks characterizes the building as containing "some of the finest mid-19th century interiors in New York." Today the building serves as the headquarters of the Department of Education. 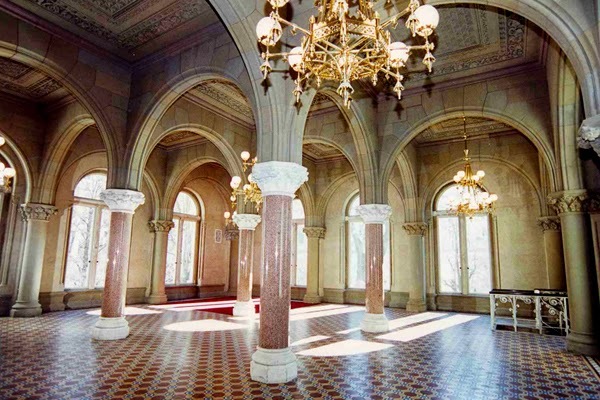 Tours of Tweed Courthouse are offered by reservation on select Fridays at 12:00 PM. The Feast Day of San Gennaro is the most important religious festival in Naples, Italy. San Gennaro, the Bishop of Benevento and martyr was persecuted for being a Christian and finally beheaded in 305 AD. According to legend, some of his blood was collected by a woman who took it to Naples where it liquefied 8 days later. 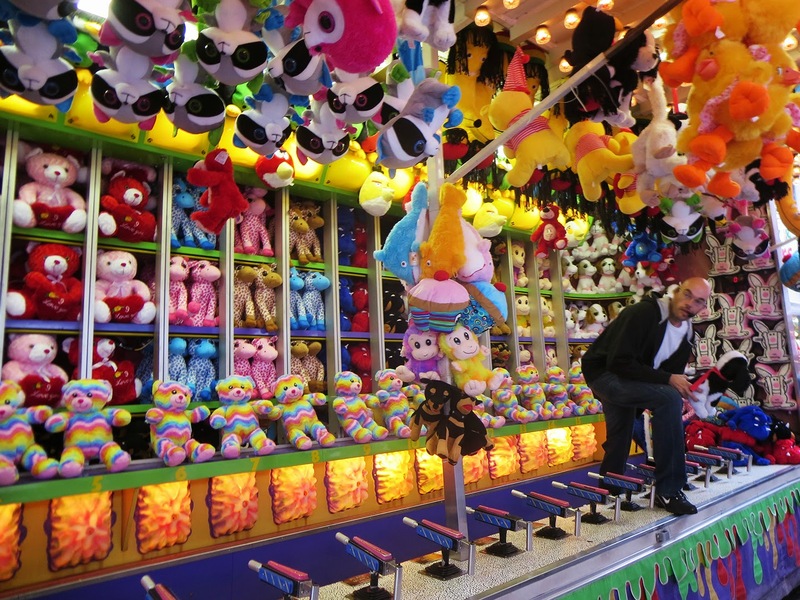 A San Gennaro festival is held in September in many Italian communities outside Italy, including New York and Los Angeles. 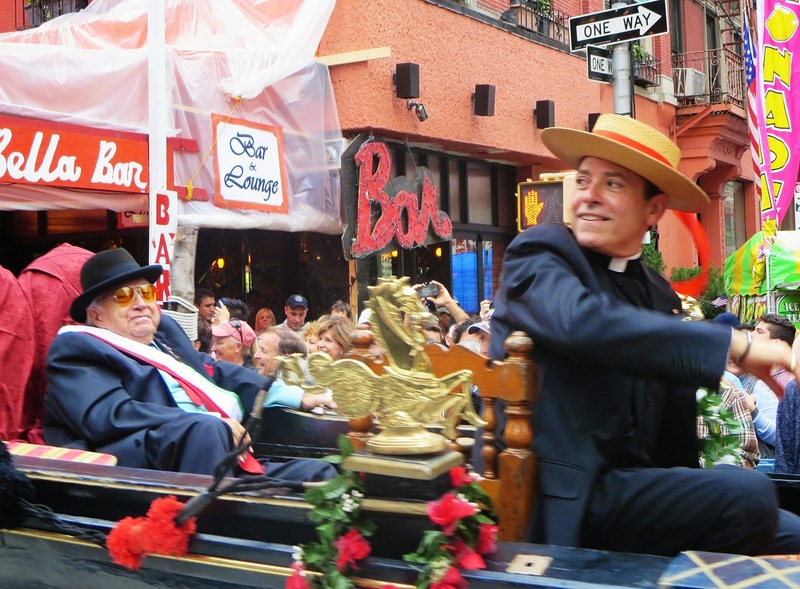 In New York the Feast was celebrated for 88 years , starting from 1926. 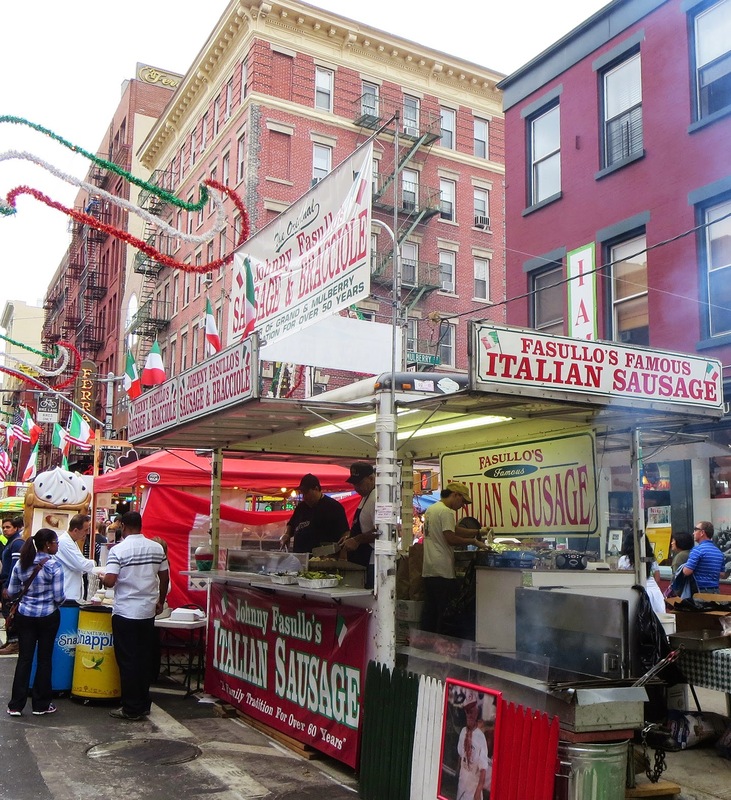 It is held annually on the streets of historic Little Italy, the lower Manhattan neighborhood which served as the first home in America for many thousands of Italian immigrants. The newly arrived immigrants from Naples congregated along Mulberry Street, between Canal and Houston Streets that is now the center of the festival. 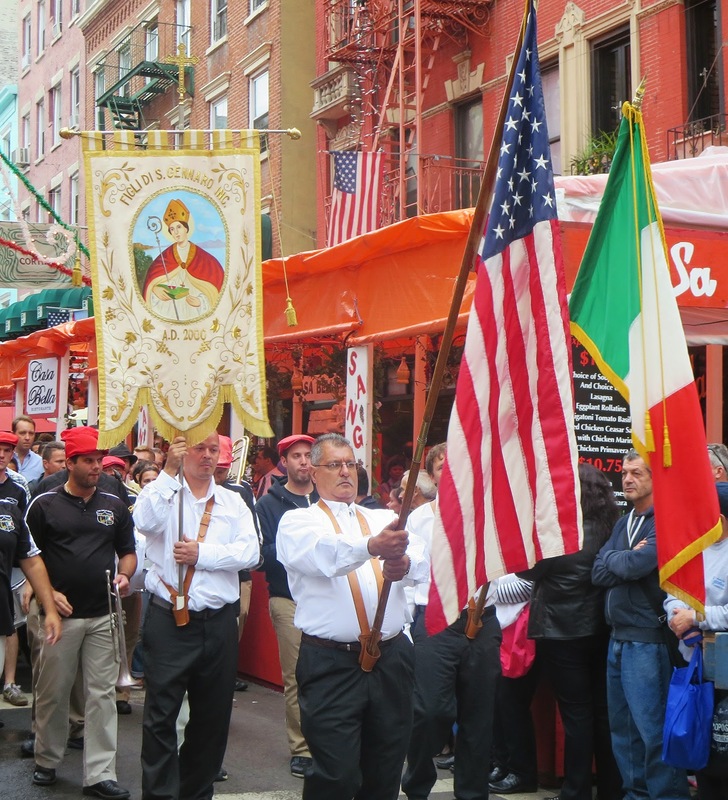 The most important day of the feast every year is September 19, the official Saint Day, in which the Statue of San Gennaro is carried from the Most Precious Blood Church through the streets of Little Italy. 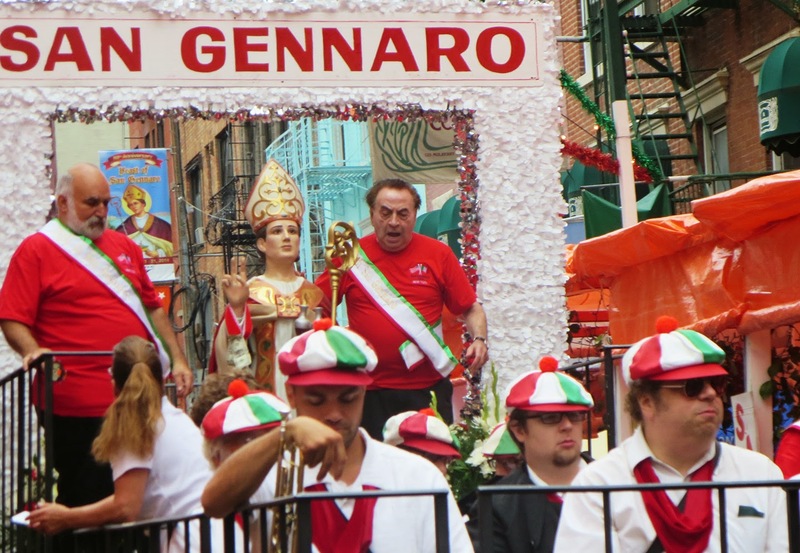 There are two Processions in the festival, each featuring the Statue of San Gennaro. The Religious Procession will start on Friday, September 19 at 7PM and the Grand Procession happened on Saturday, September 13. 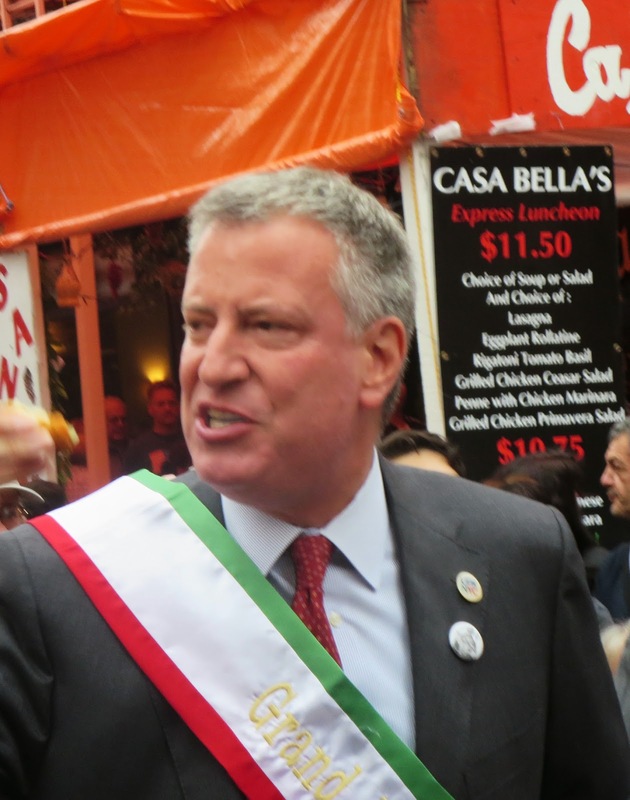 New York City's Mayor Bill de Blasio served as Grand Marshal of the Feast's Grand Procession. There were five parade floats, an authentic gondola wheels, a FIAT convertible with Miss Italia USA and Miss Italia New York, and five marching bands. Honored guests included elected officials and show business celebs, including actor Gianni Russo who Gianni starred in "The Godfather" , as Carlo Rizzi, Don Corleones wife-beating/double-crossing son-in-law. 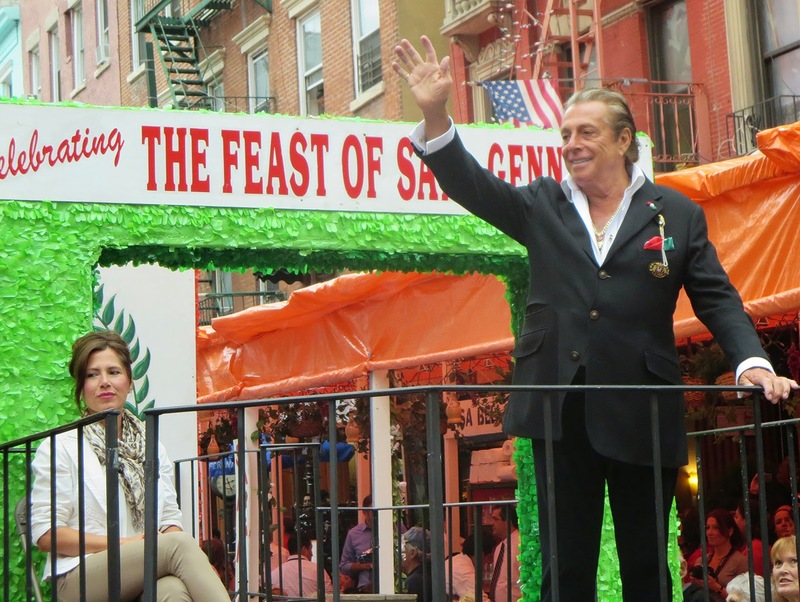 The Feast of San Gennaro was featured in The Godfather Part II and The Godfather Part III. In Part II it is during the religious procession associated with the festival that Vito stalks and assassinates Don Fanucci. In Part III, Vito's grandson (and Michael's nephew) Vincent Corleone (née Mancini) assassinates rival Joey Zasa during the festival in public, causing widespread panic throughout Little Italy. A furious Michael Corleone orders that nothing like that ever be done again. For 11 days and nights the streets of Little Italy are filled with happy people, eating fabulous Italian cuisine, listening to great live entertainment and just having a wonderful time. The streets are decorated with festive banners and arches in green, white and red and reach Times Square-level crowdedness. 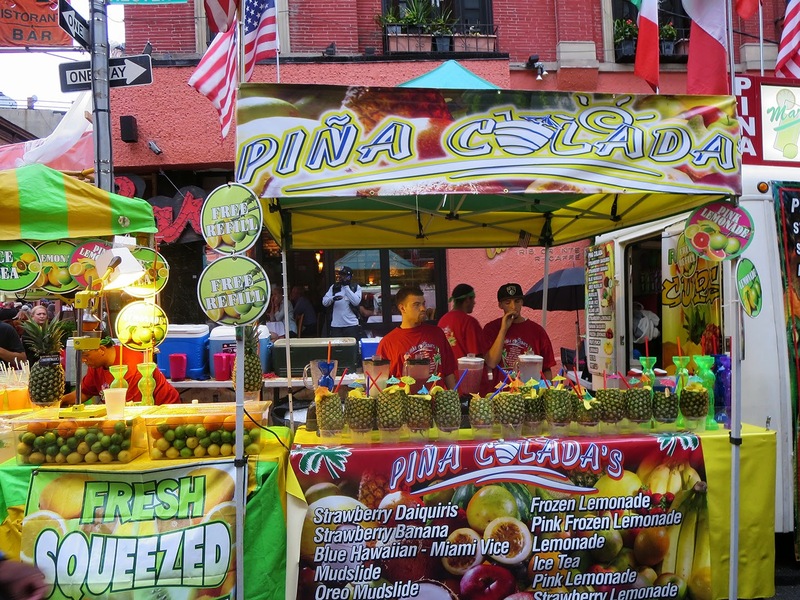 Restaurants, many of them New York City landmarks, roll out the red carpet for Feast visitors and offe a lot of food like pizza, sausage and peppers, fried twinkies, fried oreos, zeppole, paella, gellato etc. Ferrara's Café and Bakery is going to try and set the world record by creating a giant cannoli - the biggest one ever made. The giant cannoli will be unveiled to the public on Saturday, September 20, at 3PM in front of Ferrara's on Grand Street between Mott and Mulberry Streets. The giant cannoli is reportedly 12 feet long and nearly 300 pounds! September 11th, 2001 is remembered as one of the most tragic days in modern American history. Thirteen years ago the WTC’s North Tower was hit by Flight 11 at 8:46 a.m. and the South Tower was hit by Flight 175 at 9:03 a.m. The South fell at 9:59 a.m.; the North at 10:28 a.m. The terrorist attacks also destroyed an important segment of America's cultural and historical legacy. Public spaces and private offices of the World Trade Center were filled with works of art by hundreds of artists, including Pablo Picasso, Joan Miró,Auguste Rodin and Le Corbusier. 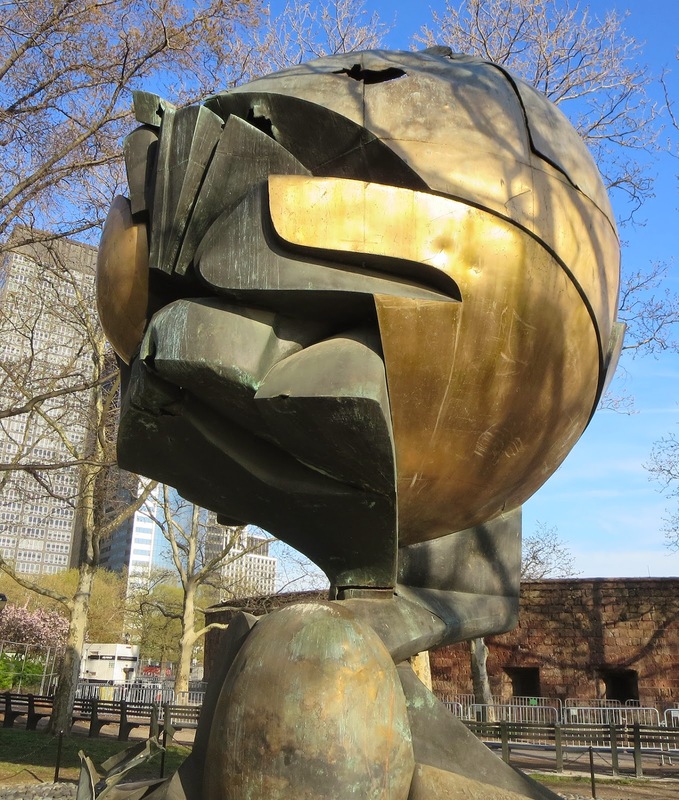 The only work of art in or around the World Trade Center that survived the inferno of September 11, 2001, is the monumental fountain sculpture “The Sphere”. 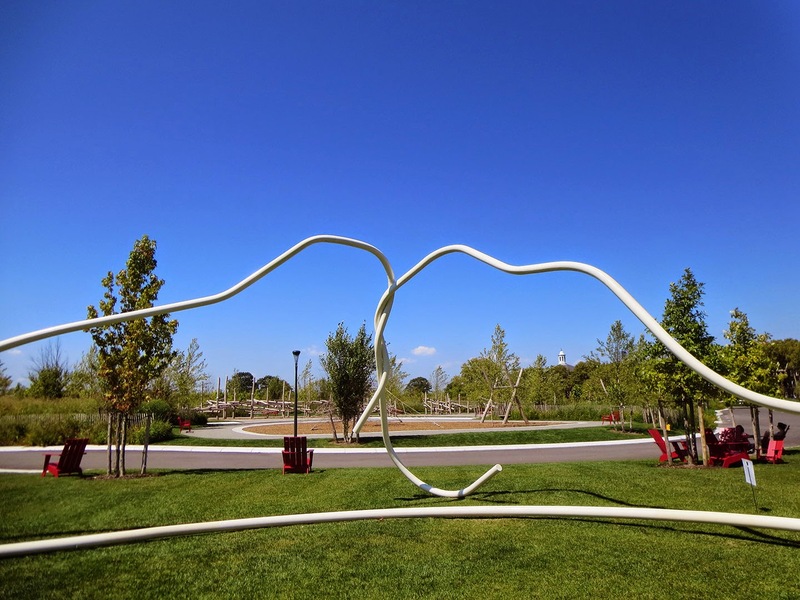 The sculpture was built by the German sculptor Fritz Koenig, professor of art at the Technical University of Munich. Koenig had been working on the sculpture in his barn in Bavaria from 1967-1971 while the WTC was in the planning stages. The sculpture, 25 feet tall and weighing 45,000 pound, was oofficially titled Große Kugelkaryatide (Great Spherical Caryatid). The artwork was meant to symbolize world peace through world trade, and was placed at the center of a ring of fountains. 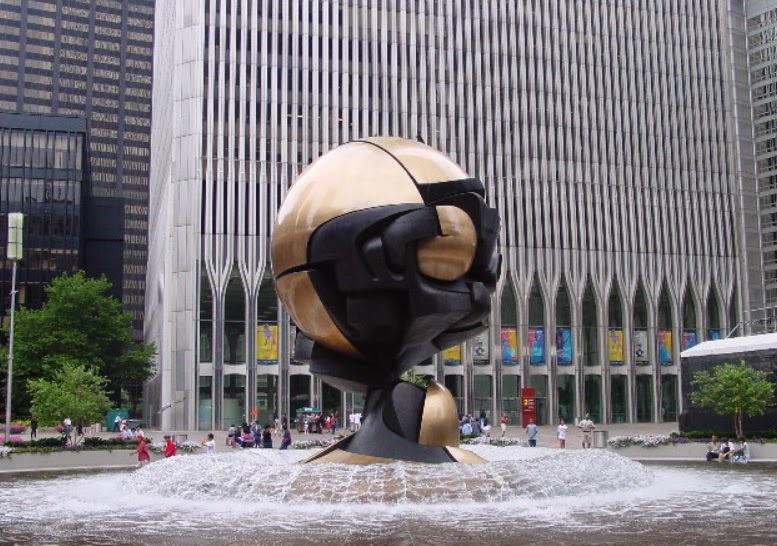 The Sphere had been in the center of the World Trade Center Plaza for three decades. 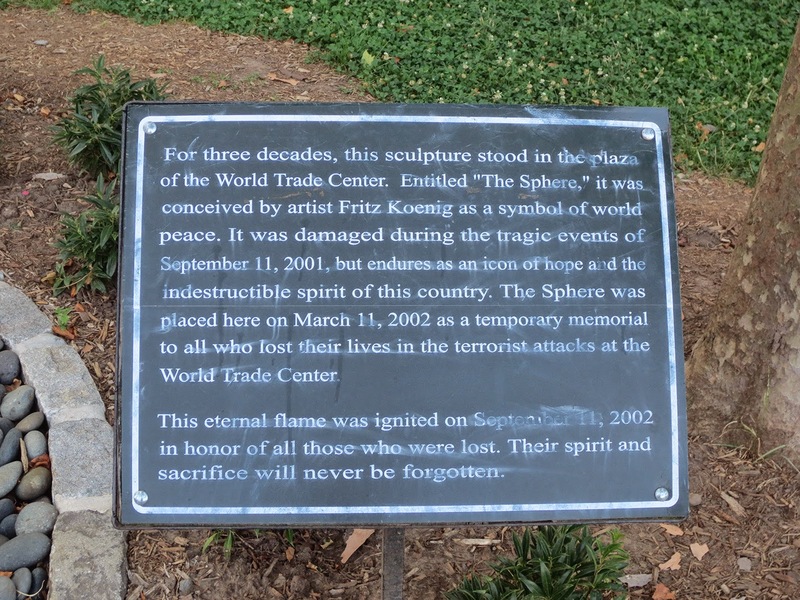 Thirteen years ago the sculpture was damaged by debris from the airliners that were crashed into the buildings and from the collapsing skyscrapers themselves. A month after, in October 200,1 Koenig booked a flight to New York City. ''I came to New York to say farewell,'' he said, to pay a last visit to what he calls ''my biggest child." ''A German poet once wrote that you don't know the meaning of a person's life until his death,'' -Koenig continued: "That is also true of art. The meaning of this artwork is that art, like civilizations, are not immortal. They are just as fragile and vulnerable as human beings....But what can you say about this disaster that took so many lives? Sometimes it is better not to talk.'' Koenig is the author of the monument to the victims of the terrorist attack at the Olympic Games in 1972 that was erected in the Munich Olympiapark in 1995. He also designed memorials to those who died at the Nazi death camp at Mauthausen in Austria. 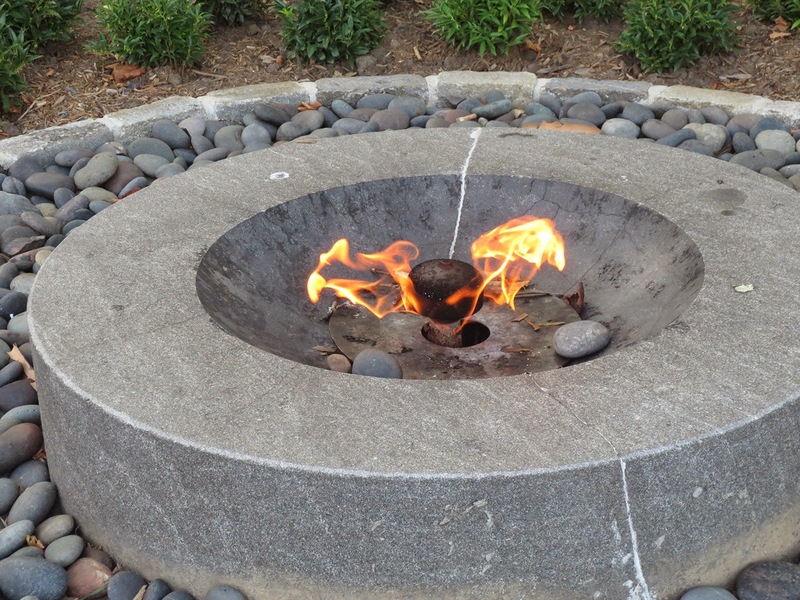 In 2002, when the prospect of a proper memorial at "Ground Zero" was still a long way away, following a documentary film about the sculpture, the sculpture was moved to Battery Park where it became a memorial with an eternal flame. Almost 13 years after the World Trade Center attacks, the National September 11 Memorial & Museum opened on May 21. 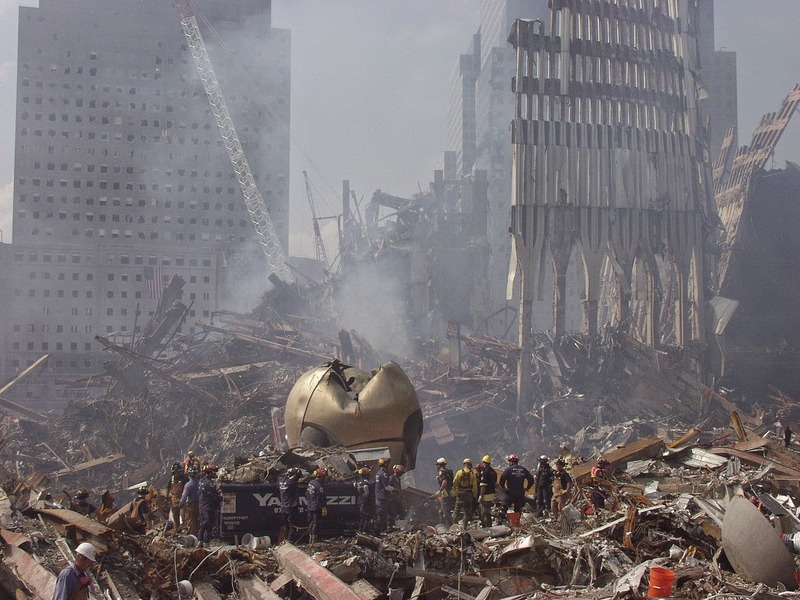 The very first display in the new museum's exhibition is dedicated to the Sphere, with photos of it before and after 9/11. They show it gleaming in the center of the plaza between the two towers, and, in a photo dated September 27, 2001, they show it standing alone and damaged in the ruins. On the eve of the anniversary of the terror attacks by Al Qaeda there are additional terror threats being pursued by the president, the NYPD commissioner and other security professionals working for New York’s safety. The NBC News/Wall Street Journal poll found that 47 percent of Americans say the country is less safe now than before the 2001 terrorist attacks on New York and Washington. Today politicians, families of those who died in the attacks and other dignitaries will gather near 9/11 museum to observe moments of silence and hear recitations of nearly 3,000 victims' names. The only ceremony open to the general public is at the Flight 93 National Memorial in Pennsylvania, which marks the site where one of the four airliners crashed. But the Battery Park with “The Sphere” is open for everybody. 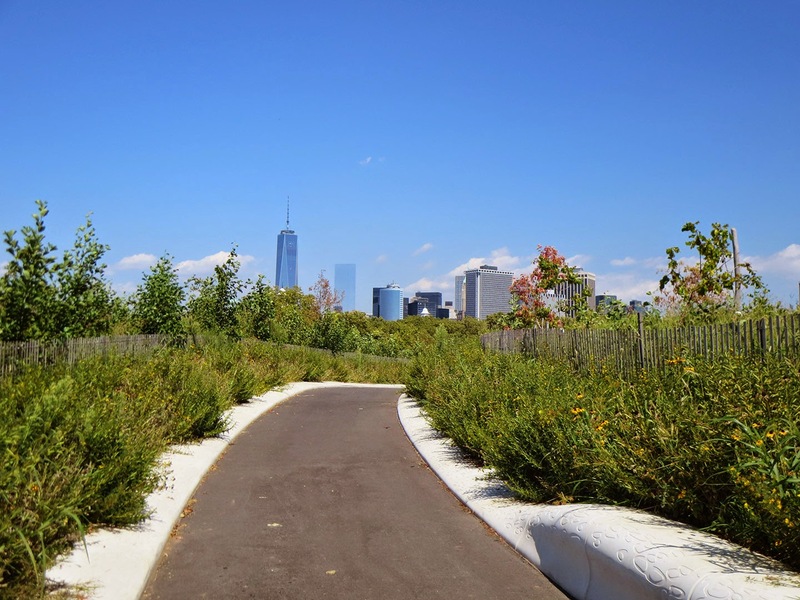 Governors Island, the car-free oasis in Upper New York Bay. There are more than two dozen islands around the five boroughs of New York City, excluding the big three—Manhattan, Staten Island and Long Island. 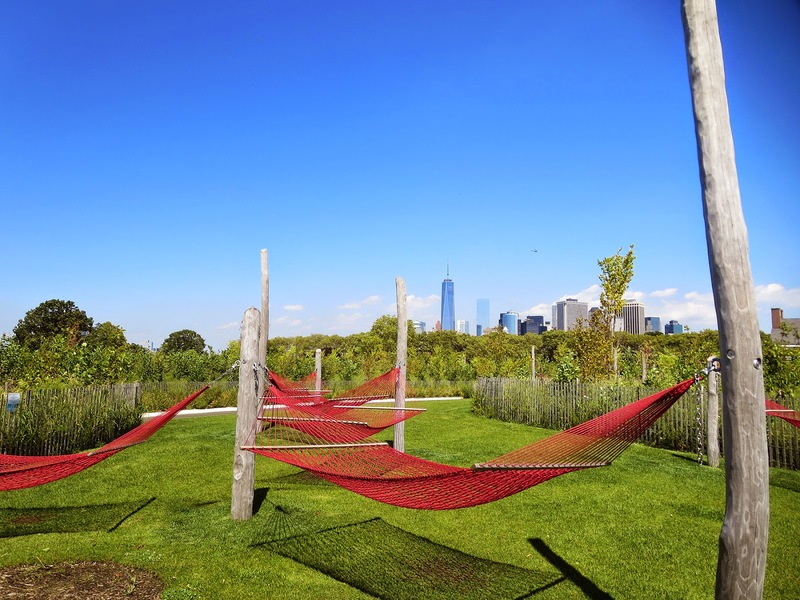 The 172-acre Governors Island—just off the southern tip of Manhattan is one of the largest and most historical of these islands. 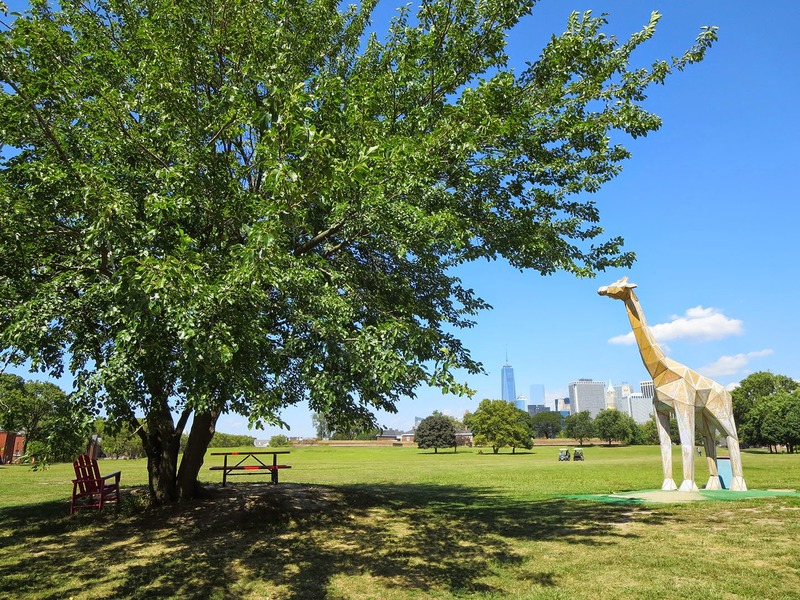 Governors Island, approximately 800 yards (732 m) from the southern tip of Manhattan, has it all: historic mansions, fort and castle, beautifully landscaped gardens, children's play area, amazing views, concerts and other events.Photo ops literally around every corner. The island is ranked N 45 among 855 New York Attractions by Tripadvisor. It is a perfect place to get away from the hustle and bustle of the downtown for just 2 dollars in 10 minutes! I visited the island a week ago and was really amazed how beautiful it is! The Wall Street Journal wrote several days ago:"Its reclamation and transformation are being hailed as a grand experiment, and it is an upbeat story as long as both current and future administrations commit to the long view in addressing the very real challenges to its continued success and integration into the life of the city". The history of the island is really fascinating. In 1513 1524, Giovanni de Verrazzano saw the island, becoming the first European to do so. At that time it was called Paggank (Island of Nuts). The New York State Senate and Assembly have recognized Governors Island as the birthplace, in 1624, of the state of New York. In 1664 ( New York was New Amsterdam before this year) the English took the Island, which had been left unfortified by the Dutch. 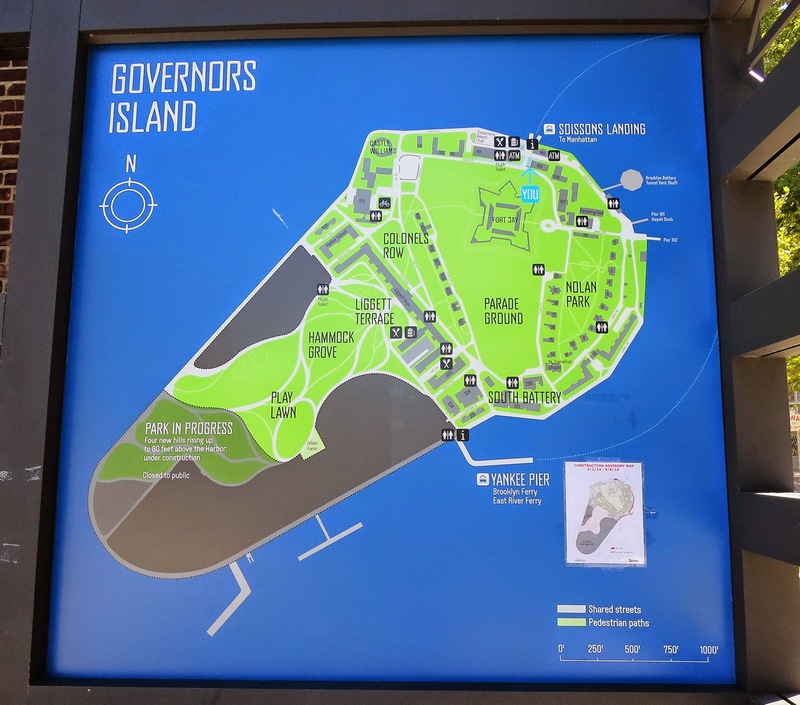 In 1784 the island was renamed Governors Island -in early times it was reserved by the British colonial assembly for the exclusive use of New York's royal governors. From 1783 to 1966, the island was a United States Army post. Before the early 20th century the size of the island was less than one third of the modern size. About 100 acres were added by 1912 using and dirt from the excavations for the Lexington Avenue Subway. From 1966 to 1996 the island served as a major United States Coast Guard installation. 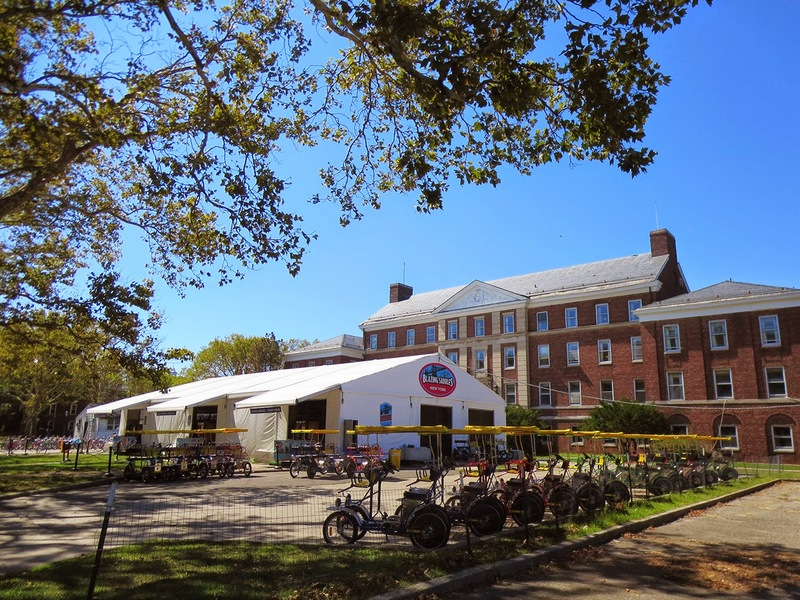 Governors Island has served as the backdrop for a number of historic events. In 1986, the island was the setting for the relighting of the newly refurbished Statue of Liberty by President Ronald Reagan. In 1988, President Reagan hosted a U.S.-U.S.S.R. summit with Mikhail Gorbachev on Governors Island, and in 1993, the United Nations sponsored talks on the island to help restore democratic rule in Haiti. On January 19, 2001, two of the island's three historical fortifications, were proclaimed a National Monument, and on the same month 150 acres (61 ha) of the island was transferred to the State and City of New York for $1. 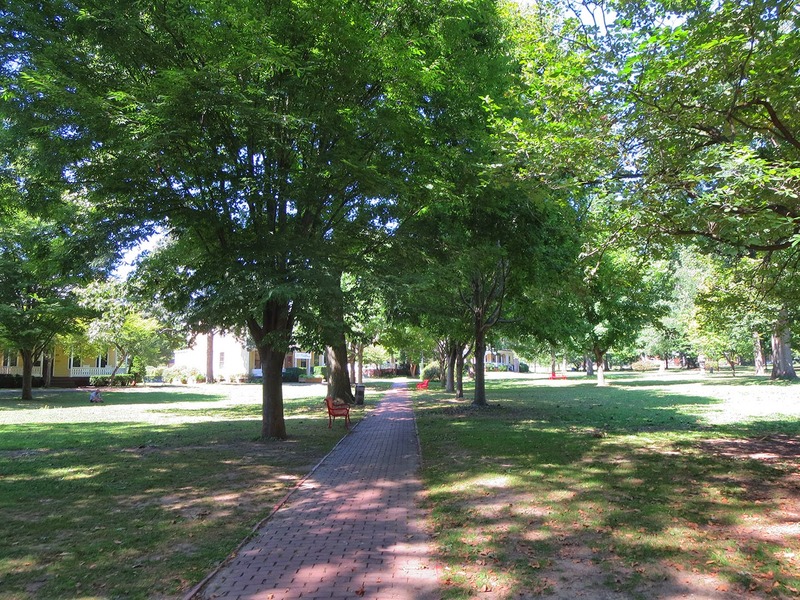 Today, the northern part of the island is a historic district with 52 landmark buildings, including stately officers' quarters known as Colonels Row built in the 19th century, a 350,000-square-foot barracks, an infirmary and a stockade. 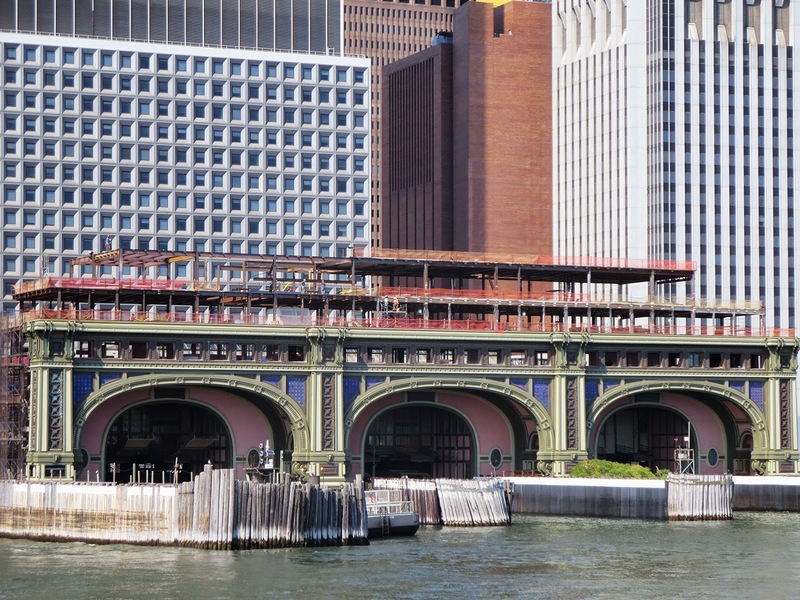 The island is accessible by the ferry located in downtown to left from the Staten Island ferry in The Battery Maritime Building. 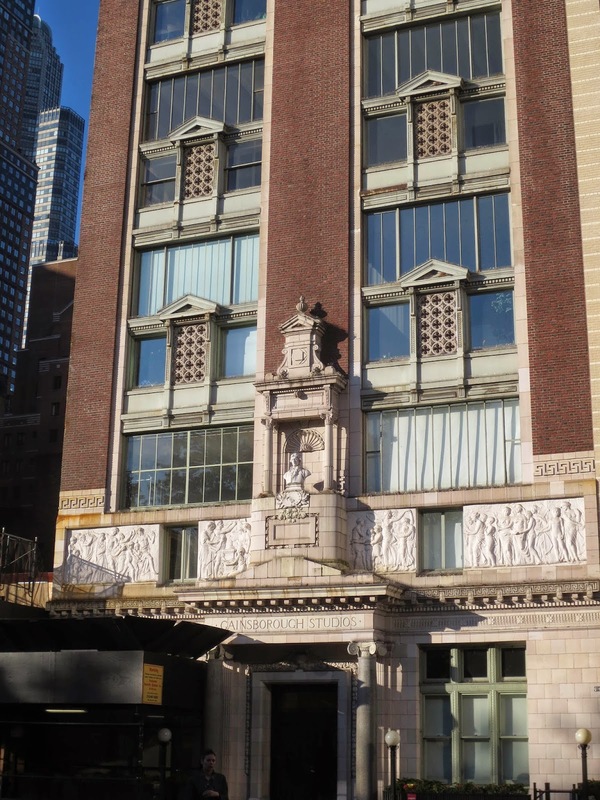 The Beaux-Arts building was built in the beginning of the 20th century and was used by ferries traveling to 39th Street in Brooklyn till 1938. 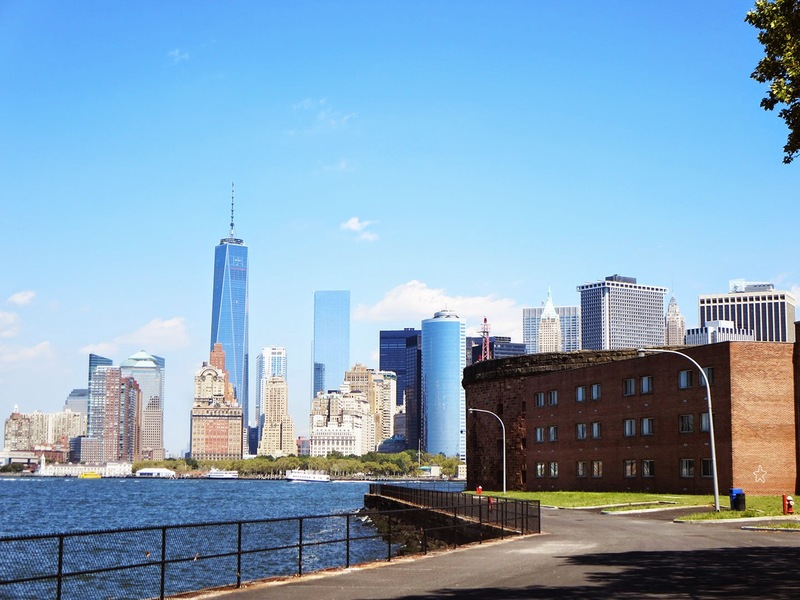 In 1956, the U.S. Army began use of the terminal to provide service to an Army post, Fort Jay on Governors Island. Starting from 1966 till 1996 the United States Coast Guard used the terminal. Between 2001 and 2005, in a 36 million dollar renovation, the building was restored. Ferry run all seven days from 10 AM till 6 PM. 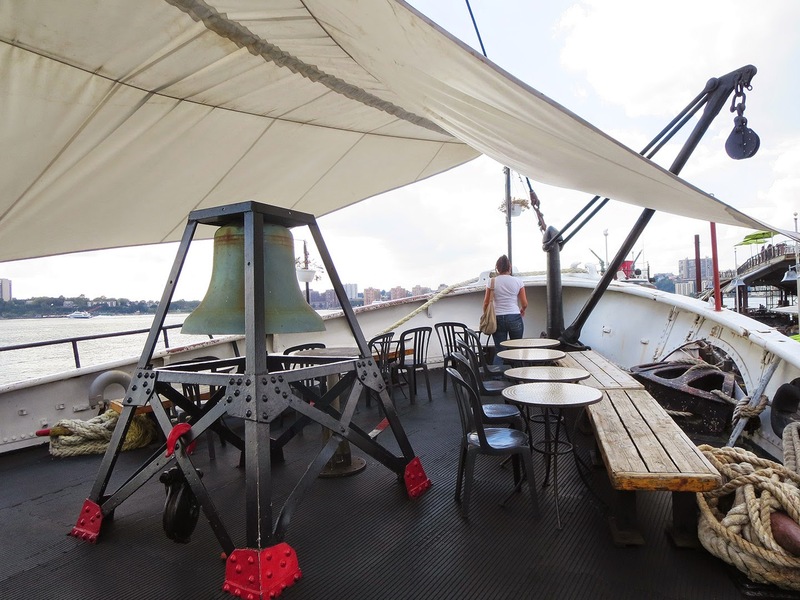 There is also a ferry from Brooklyn Bridge Park's Pier 6 on Saturdays, Sundays, Memorial Day and Labor Day. If you plan to visit the island on a weekend- try to take the first ferry- lines could be really long! 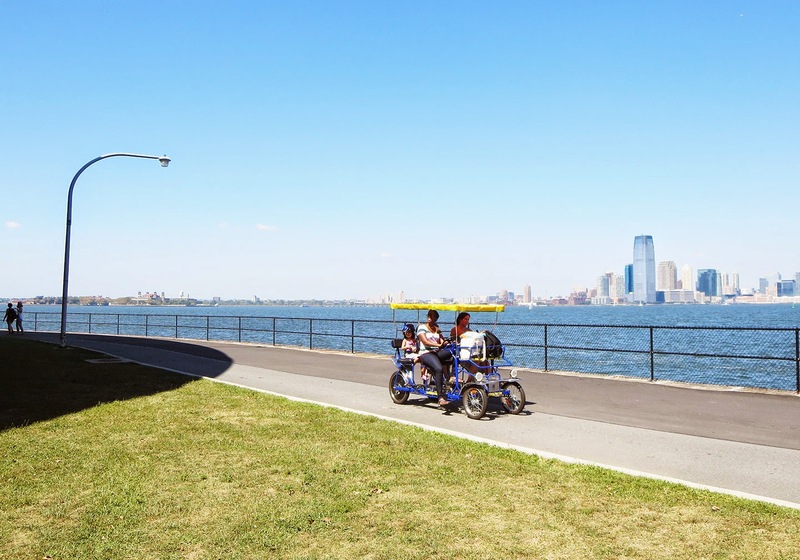 If you plan to visit the Governors Island on a weekday and plan to spend the whole day on the island, you can park your car on a Brooklyn Army Terminal for free, then take a ferry at 10 AM to Pier 11/Wall street. 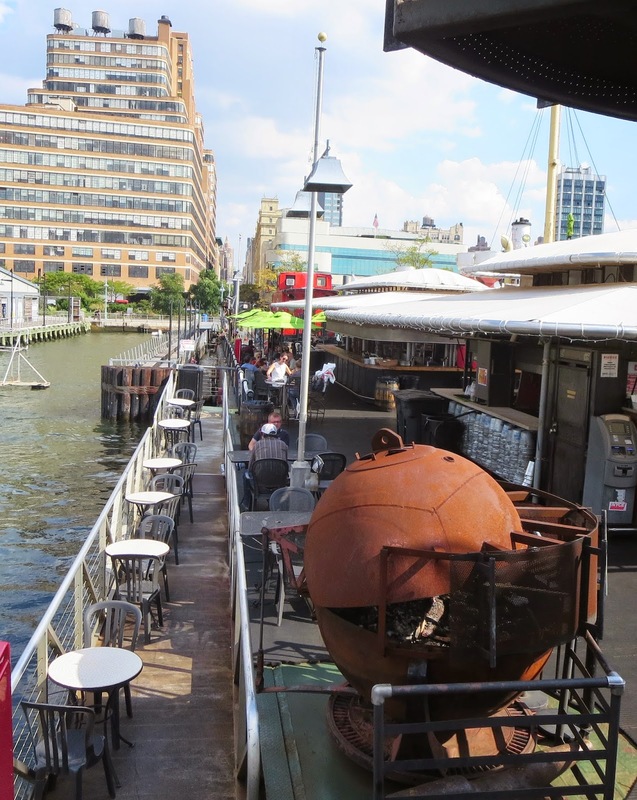 There is a nice 10 minute walk from Pier 11 near Wall street to the Governor Island ferry. If you are an early bird and are lucky to be free on a weekday you may enjoy Free Bike Mornings, a new program this year that allows visitors to borrow a bike for free for up to one hour every weekday between 10 AM and noon.